This may be the most common problem that WordPress bloggers run into. Crawling blog load speed can be caused by many different things, which without actually digging in and investigating, it is impossible to guess. There are however, some simple things you can check before you sound the alarm. Chances are it will be one of the things I will tell you about below. Take a look at each of the culprits below and read through each one to see if it might be what’s causing your slowdown and then see how to deal with it. WordPress is a wonderful tool that comes ready for thousands of plugins that make it even more powerful than it already is, if that is even possible. Newbies as well as some professional bloggers tend to use every single plugin in the universe on their blog. What they do not know is that each plugin has a powerhouse of functions inside that grind away producing the results it is designed to produce. Adding one plugin will slow the blog down while it goes through its rounds. Imagine when you have ten plugins installed, or perhaps ALL 18,772+ OF THEM (at the time of writing). SOLUTION: Please, for goodness sake, disable all of your plugins. Go through them and find three to five that you REALLY NEED and can’t live without, and enable only them. Anytime you find another plugin that does something really cool, think about if it is really worth slowing down the site for it. I recommend you take one out if you want to add a new one. Don’t have more than five at any given time. Now, I know that this may not work for some and so I say, this is just a benchmark for you, a goal to try to strive for and keep in mind as you add more and more “cool” plugins. Stop it! Sometimes, a broken plugin or a widget that pulls in content or communicates with an external source in some way, will sit there trying and trying until the server’s timeout is reached. While it is sitting there trying, the blog will sit and wait to load anything that is below the said code. So until the timeout is reached, your blog is half loaded and the readers leave losing interest. This same thing may happen with a completely healthy plugin/widget too if the external source is down or unresponsive for any reason. SOLUTION: When you see a slowdown on your blog, check what may be slowing it down by checking the status bar. This is the bar that is at the bottom of your browser. It will tell you what’s going on. When you mouse over a link, you will see the URL that the link is going to take you to if you click on it. While the blog is loading, the status bar will show the URLs of things that are being loaded. If it gets stuck, you will usually see something that will say “Loading www.domain.com…” or “Waiting for www.domain.com…”. By checking for this, you should be able to tell what is slowing down the site pretty quickly. A problematic plugin will reveal itself in the status bar as it sites trying to load an external source. To fix this once you find the culprit just either desable the plugin or update it to the most resent version. Sometimes, giving it some time may make the problem go away as the plugin “mothership” fixes their problems. When the database is out of date, WordPress may have some issues and would take more time to process things. Some web hosts update WordPress as a batch for everyone that has it installed on their server. If they do that, the database does not get updated automatically and needs to be updated manually. When WordPress has been updated but the database is still running the old info, it may take it extra time to determine that it is old and apply the functions that make it adapt. You want your blog to be streamlined and take out any extra processes that slow it down. SOLUTION: Well, the rule with a blog is you should be logging into it and posting new blog posts on regular basis. This way if your web host has updated WordPress on you, when you log in, WordPress will tell you to update the database. You will simply click the button to update and it’s taken care of. Not every time when your blog is slow will it be something you can do about, specially if you are running it on a shared server. Hosting companies are not perfect, even if they are promoting their 99.9% uptime. That 00.1% will probably happen on your clock. When that happens, you’ll just have to wait until they resolve their issues. If the shared server that your blog is hosted on is being attacked or is running slow for any reason, your blog will show the symptoms in the load times and page availability. SOLUTION: Although there is not too much you can do about this, there is a couple of things that give you better chances of having less down-time. One is to host your blog on a private server. This way you are not sharing it with anyone else’s websites and you have all the resources to your self. You will however take care of the security on your own too, so a good server administrator connection is a must. The second way to avoid hosting uptime issues is to find a host that has been around for a long time and that has things figured out. Read reviews and see what existing customers say about their service. I personally have seen that GoDaddy hosting has the most reliable uptime and support. Having said that, I want to say that I do not support GoDaddy for their tasteless commercials and marketing methods and would rather not talk about them but the fact stands that their hosting service has been the most solid than any other company I’ve hosted my sites in the last 10 years. Don’t take my word for it, do your research and read the reviews. When you check for all the things above and it is not them causing the issues, or you are not willing to part with your precious plugins, your next step will be to up the memory or processor on the server to allow the space and power for the server to process things faster. Memory is where the server stores short term things, as it processes functions and commands it places bits of info into the memory and uses it back and forth. When there is a lot to process, it needs more space to put those bits. Otherwise it gets in line and waits which creates slow downs. Processor is what actually computes and runs the processes that take care of all the things need to be done. If it does not have the capacity to get things done as fast as they are thrown at it, delays happen and things slow down. SOLUTION: Add more memory and or processor speed to the server. Ask your web host to add memory and bigger processor to the server for you. This will only work on a virtual private server or a private server where you can (or they) control how much memory and how much processor speed it has. Shared hosting accounts will most likely not have this option and will just have to deal with the slow downs or get rid of some of them plugins. Just as above, when your server’s hard drive starts to run low on space, the server will start to swap old files out with new ones and that takes extra time. When you have a lot going on the blog this becomes a large waste of resources. SOLUTION: As with memory and processor, your choice is to either lower the resource consumption or increase the hardware power, in this case the storage. If you are running your blog on a shared hosting account, you may not have many choices and may only be able to upgrade to the next level account that offers more storage. With a virtual private server or a private server, you will have more control of what happens there. It would be easy to add more storage space in this case. More popular plugins get updated more often and when a new update comes out, there is usually a good reason why they release it. When WordPress gets updated, they change things in the inner core of the programming and sometimes this will effect how plugins run and communicate with it. This change in the platform may create errors and various unknowns in the system so you want to make sure you stay on top of updating your plugins. SOLUTION: WordPress is designed to let you know about available updates. As you log into your admin panel you will see numbers next to the Plugins button in the sidebar. This means there are plugin updates available. 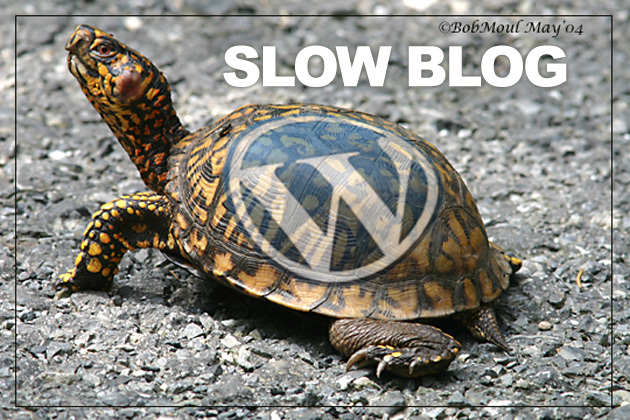 Don’t delay to update them, do it right away to prevent any kind of slow downs on your blog. Now, this would be a good problem to have. Having lots of traffic means your blog is being used a lot and therefore using a lot of resources. The processor, memory and probably storage are the things that you need to take a look at and possibly upgrade to provide more space for everything to run smoothly. SOLUTION: Look at the usage statistics on your server and see what resources are getting close to their limit. Upgrade those items so you are only using half of it and have half available for future growth. If you are on a shared hosting account, you should upgrade to the next level or start thinking about moving to a virtual private server. As we get down this list to number 9, this is less likely to happen but it still is a possibility and so you should check and make sure you are not running a really old version of WordPress. Older versions, although they were powerful and awesome in their time, are now outdated and may not be as optimized as they can be. SOLUTION: Upgrade your WordPress. If you are running a really old version that does not allow you an automatic upgrade, you will need to back up your content and settings, and then upload the new version of WordPress to your server manually. If your WordPress is newer than version 2.7, you should be able to just click a link in the Admin panel to upgrade automatically. It is very unlikely that you are experiencing a DOS attack, but if you are, your blog must be pretty popular or someone really dislikes you. A DOS attack is when many connections to a website are opened all at one time. Hackers can stage this automatically using many hacked computers around the world, trying to open the same web address all at one time. Thousands to millions of requests to your blog at the same time will time out your server and the website will be offline or be very slow. SOLUTION: Call your web host provider and tells them what is happening. They will have to take the site offline to time out all the requests. Attacks like this may last for minutes or hours, so the only way to recover from this is to wait it out. When the attack is over, your website will come back online. These were the most common reasons why your blog could be running slow. This list is by no means the limit of what could be slowing down your particular blog but in most cases the top 6 items on this list will be what is happening. If you have something else that has happened to your blog that slowed it down and you would like to share, we’d love to hear your story and the solution you used to resolve it.